The view from the reception of InterContinental Phu Quoc Long Beach Resort. Tucked away off the coast of Cambodia lies the Vietnamese island of Phú Quoc, a hidden paradise that is set to become the next must-see destination for island lovers and experience seekers alike. 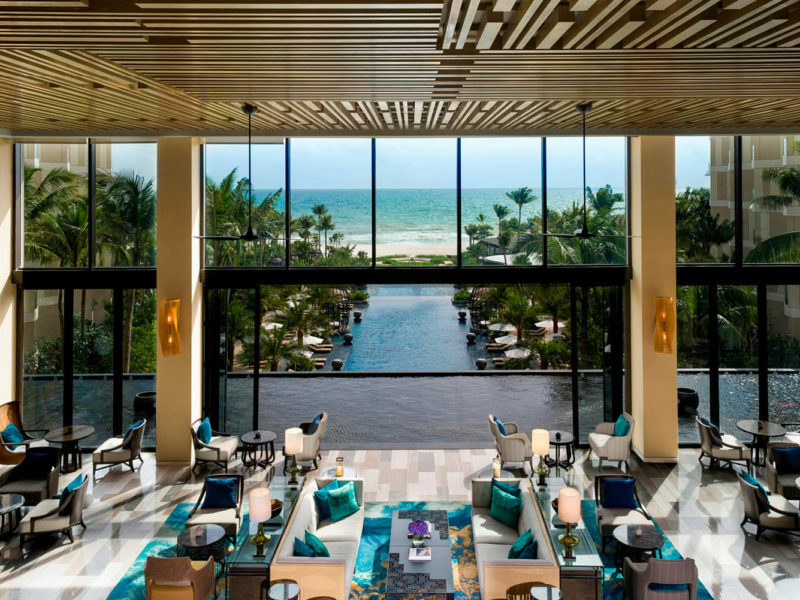 Rising up from the palm-lined coast on the south-west side of Vietnam’s Phú Quoc Island stands the InterContinental Phú Quoc Long Beach Resort, one of the first of many international resorts to open on the island. The design of the resort, with a 19-storey middle tower flanked by two wings that wrap around the main pool, is impressive but not imposing, thanks to an abundance of tropical plants – especially the palms and rooftop gardens that work to almost blend the resort into the natural landscape of the island. At the end of each day, everyone in the resort stops to watch the sun set over the water. 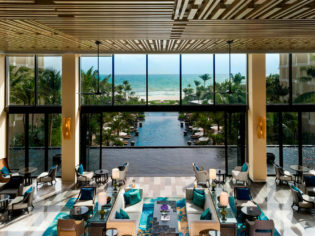 Upon arrival at the Intercontinental Phú Quoc you’re met with the uniquely designed foyer of the main tower (the traditional basket boats that line the ceiling are a striking addition), and taken through to the windowless reception that opens out to give you views of the pool that seemingly stretches out to meet the sea. A view of one of the rooms available at the InterContinental Phu Quoc Long Beach Resort. The resort has 459 rooms, suites and villas to choose from that vary in size to cater for groups, families and couples. But three nights in the Panoramic Suite is enough to ruin you for all other accommodation. At 101 square metres, the suite features an open-plan bedroom, office, lounge and bar that connects to a large bathroom with a bath and shower, separate toilet and walk-in wardrobe. Tall glass doors open out onto your own generous-sized balcony with views of the beach to be enjoyed from your outdoor setting. The poolside Italian restaurant Ombra, is great for lunch, snack and freshly-made juices and smoothies. It is the finer details that really make this room a standout: the sensor lights of the walk-in wardrobe, the view of the ocean from the deepest bath I have ever bathed in (complete with cushioned headrest and bath salts, of course! ), the shower with sit-down bench – and multiple shower heads, and the balcony with private cabana for those days when you want to escape the other guests. An aerial look at the resort’s LAVA restaurant. There are six restaurants and bars to choose from with a variety of different cuisines on offer. Ombra is the resort’s Italian restaurant, located just beside the main pool area. You can also order fresh juices and smoothies for a lighter option; I’d recommend a mango and mint smoothie. A full buffet breakfast is served at Sora & Umi (you must go the full Vietnamese spread for breakfast at least once) and it is also a Japanese and Vietnamese restaurant at night. Watch the waves roll in as you enjoy a meal at LAVA. For an extra special night out, you need to eat at LAVA, the resort’s seafood and steak restaurant. You’ll be able to watch the waves roll in from your table and dine under the stars. Then there is Sea Shack to satisfy your barbecue craving, Pearl for a fusion of international cuisines, and finally INK 360. Take the lift up to the 19th floor to find INK 360, the resort’s rooftop bar. The rooftop bar – which is the highest sky bar on the island – is the work of Australian-born interior designer, Ashley Sutton. He’s famous for his Iron Fairies bar in Tokyo and The Bookshop in Bangkok, and INK 360 is the latest in his growing list of fantastical creations. The ginormous octopus tentacles that spill out from the roof to envelop the bar will have you feeling like you’ve stumbled upon a shipwreck floating in the sky. Make sure you’re here for sunset and order a Coral Mule from mixologist Giuseppe Tronik. The cocktail is adorned with a flowery pink snow mushroom, which is guaranteed to bring in the Instagram likes. The best place to watch the sunset is at INK 360 with a cocktail in hand. The Harnn Heritage Spa is an oasis of tranquility. No island holiday is complete without a spa treatment and the HARNN Heritage Spa is a tranquil oasis of indulgence that is too good to be missed. There are eight spa treatment rooms set within individual retreats overlooking a large lagoon filled with koi fish. Try the signature bamboo stick massage – it’s like a hot rock massage only better! Retreat together as a couple and indulge in one of the many luxurious treatment options at the Harnn Heritage Spa. You’ll also find four outdoor swimming pools, a 24-hour gym complete with self-defence classes, kids’ clubs for all ages with certified nannies, and you can pick up food supplies from the resort’s grocer Mercado (or sit down for an ice-cream, Vietnamese coffee and a snack). Cool off in one of the many pools available at the resort. A holiday on Phú Quoc can be as chilled or activity-packed as you want it to be. You don’t have to have a standard resort holiday with every day spent by the pool, punctuated by meals and cocktails – unless that’s your jam. The island has much more to offer than nice views. Of course the InterContinental has a number of activities you can book within the resort, from cooking and cocktail classes, to basket boat rides and beach yoga sessions, but you can also take a catamaran out for the day, snorkel the nearby islands and enjoy a freshly cooked seafood meal on board. Go for a ride in a traditional basket boat. The bustling night markets are only a short drive away (try the warm banana and sticky coconut rice wrapped in a banana leaf), as is Sao Beach. Or better yet, hire a motorbike and make your way to the secluded Starfish Beach. You’ll need to pack food, drink and sun protection and ride along sandy trails through the national park to reach the beach. You’ll find a colony of red starfish sunbathing in the crystal clear waters waiting for you. Phú Quoc even has its own mini-version of Sculpture By The Sea at Sunset Sanato Beach Club. You’ll find elephants on stilts coming out of the water and a large, imposing sculpture of a head sliced in two, adjoined by a doorway that visitors can walk through. The best views on the island are found on the Sun World cable car. The island is also home to the world’s longest non-stop sea cable car. The Sun World cable car connects An Thoi town on the south of the island with Hon Thom Island and it will take you 15 minutes each way. But it’s the views of the pastel-coloured fishing boats that speckle the bright turquoise water below that really make this ride one to remember. The world’s longest non-stop sea-crossing cable car can be found in Phu Quoc. This resort has something for everyone. Families can take advantage of the first-class kids’ clubs and kids’ cooking classes and facilities, while couples can relax by the adult-only pools, wine and dine at the many restaurants, and splurge on indulgent spa treatments. The Harnn Heritage Spa takes care to make every detail of your time with them an indulgent experience. More than half the island is a UNESCO-listed Biosphere Reserve, making it a lush green oasis that also boasts crystal-clear waters, powdery white sand and an average annual temperature of 27 degrees. It is a quick 45-minute flight from Ho Chi Minh City to Phú Quoc, and the resort is a 15-minute drive from the airport. It is the perfect end to a longer stay in Vietnam for those looking to relax for a few days before returning to reality. The style and decor of the resort can only be described as understated luxury. It seems that every detail has been designed with the sunset in mind: from the layout of the resort that aims to capture the ocean from every angle, to the rooftop bar, INK 360, on the 19th floor – which is arguably the best of many excellent places to watch the sun set over the ocean. I can’t fault the service I received at this resort. Staff were kind and attentive; there is a whole office space full of staff ready and waiting to organise activities for you on the island and in the resort. Checking in and out of the resort was seamless. The view from the bathroom in resort’s Panoramic Suite. Nearly all rooms have views of the ocean and each accommodation type is stylishly designed with superb attention to detail and understated luxury – regardless of whether you’re staying in a classic room, suite or villa. Order the El Copete (like a pisco sour) at INK 360. Incredible variety and quality: the perfect mix of Vietnamese, seafood and modern international cuisine. The architectural design of each restaurant makes dining here as much of a visual feast for the eyes as it is an edible one. Dining inside the resort’s LAVA restaurant is an experience not to be missed. A King Bed Resort Classic Room (without ocean views) starts at $225 a night, which is an affordable resort holiday for most. You also get a fresh fruit bowl upon arrival and complimentary access to the wi-fi, the 24-hour gym and the resort’s car park throughout your stay. Vietnam Airlines flies direct to Ho Chi Minh City from Sydney and Melbourne in under nine hours and it is an additional 45-minute flight to reach Phú Quoc Island. Spend a few nights exploring incredible Saigon before changing pace by moving on to Phú Quoc. My Dreamliner flight from Sydney to Ho Chi Minh City was more than comfortable, with generous sized economy seats, excellent service and good quality food and drink. There was also a wide selection of TV shows and films onboard to choose from, including the knock-out hit, Crazy Rich Asians. Once you reach Phú Quoc you’ll find taxis, cars and motorbikes for hire, and resort shuttles are available for getting around the island and to and from the airport. A new wing has recently opened at the airport, roads are being relaid and there is plenty of construction work underway in preparation for the expected influx of tourists in the coming years. Do you need more help planning your Vietnam trip? Read our guide on everything you need to know before you go.